Syracuse University Press, 9780815608080, 2000pp. 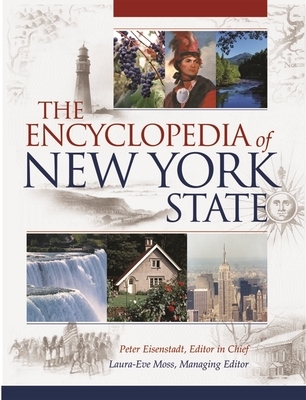 The Encyclopedia of New York State is one of the most complete works on the Empire State to be published in a half-century. In nearly 2,000 pages and 4,000 signed entries, this single volume captures the impressive complexity of New York State as a historic crossroads of people and ideas, as a cradle of abolitionism and feminism, and as an apex of modern urban, suburban, and rural life. The Encyclopedia is packed with fascinating details from fields ranging from sociology and geography to history. Did you know that Manhattan's Lower East Side was once the most populated neighborhood in the world, but Hamilton County in the Adirondacks is the least densely populated county east of the Mississippi; New York is the only state to border both the Great Lakes and the Atlantic Ocean; the Erie Canal opened New York City to rich farmland upstate . . . and to the west. Entries by experts chronicle New York's varied areas, politics, and persuasions with a cornucopia of subjects from environmentalism to higher education to railroads, weaving the state's diverse regions and peoples into one idea of New York State. Lavishly illustrated with 500 photographs and figures, 120 maps, and 140 tables, the Encyclopedia is key to understanding the state's past, present, and future. It is a crucial reference for students, teachers, historians, and business people, for New Yorkers of all persuasions, and for anyone interested in finding out more about New York State.